Clean, tidy and comfortable. Hotel is ok value for money. Bed is comfortable. Staff were pleasant and the room was incredibly clean for a 3 star hotel. 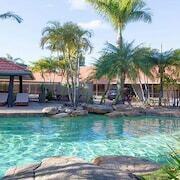 Make going to and from the airport easy when you book a stay at one of the hotels close to Brisbane airport. You’ll be able to go from the runway to a comfortable hotel bed in no time. 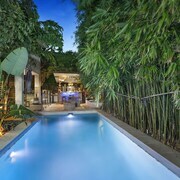 Or down to the pool. Or the workout facility to squeeze in a quick set. Use the wake-up call service in the morning and start your day. Start your morning off with a fresh cup of coffee or tea and read the newspaper before getting on with your day. 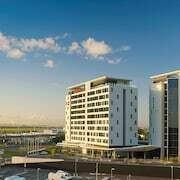 The proximity to the airport make these hotels perfect for the in-and-out business traveller. 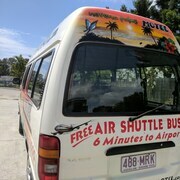 Don’t stress about transportation, as most of the hotels near Brisbane airport will provide courtesy shuttles to and from the airport for your convenience. You won’t go hungry here—there’s plenty of establishments nearby serving up tasty plates for your belly. We don’t want you to have to jump through hoops when you arrive for your holiday. 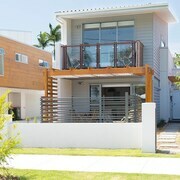 Browse through lastminute.com.au’s Brisbane airport hotels and find the best offers for you. 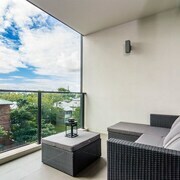 Why not squeeze in some relaxation while you close a big deal? Head for the airport and be on your way!